Whether you’re enjoy Sunday Funday or winding down from a wild weekend, meet us by the pool every Sunday starting at 11 am and stretch out in the warm Florida sunshine, no need for a swimsuit! Come as you are and enjoy complete relaxation in one of our two clothing optional pools. Or dance poolside with our professional DJ spinning all your favorite songs. Our two hot tubs are bubbling and inviting, and our conversation pool is the perfect place to meet new friends. Want to really relax? Reserve your very own cabana and lounge in comfort, complete with power outlets, lighting, curtains, and ceiling fan. Meet new friends, catch up with your sweeties, and rehash all the weekend’s festivities as you spend Sunday the way you always dreamt it could be! Late check out is available on Sundays only, so take advantage of every last bit of weekend and make plans to spend the afternoon indulging with your friends at Secrets. Or let loose and spend the evening with us - reduced room rates on Sunday evenings make splurging on an extra day an epic way to end your sexiest weekends. 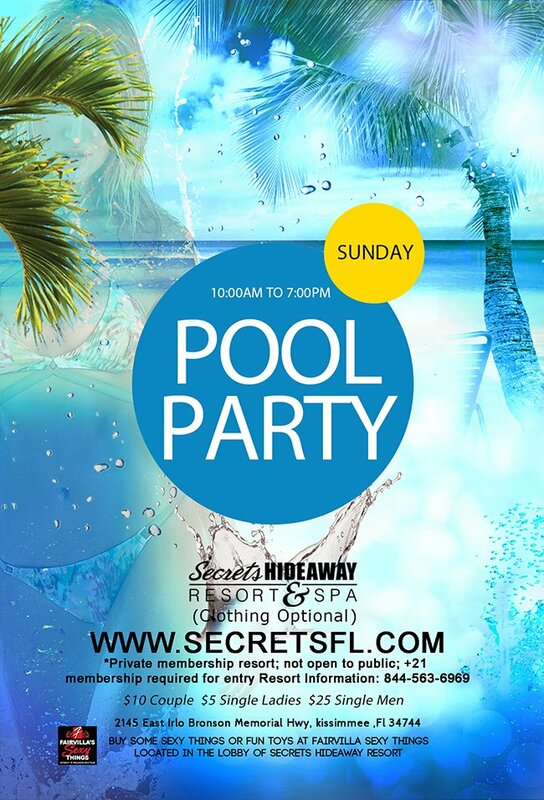 With two tiki bars serving your favorite cocktails and a full lunch menu, you’ll have plenty to keep you fueled as you spend Sunday Funday at the sexiest clothing-optional pool party in Orlando! Room check in is after 3pm. Check out is 11am sharp. Late check out (3pm) is available on Sundays only. Please see the front desk. Reserve your poolside cabana, and it's all yours for 8 hours of fun and relaxation (9am to 5pm OR 7pm to 3am)! !